Two 10-year-old boys met in Sunday School at a church outside St. Louis, Missouri, becoming fast friends and spending weekends together over the years, tinkering with their bicycles, mini bikes, motorcycles, and eventually, cars. When the young men went off to LeTourneau College in 1977 to study business, they thought they might someday even start a business together. Little did they know that their dream would eventually come true --40 years later --with another garage collaboration that would be fine-tuned for missionary families who need reliable transportation during furloughs. 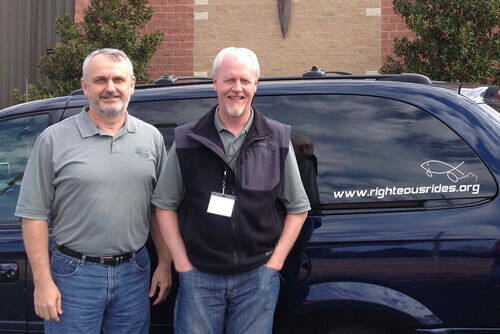 LETU alumni Mark Reighard '81 and Bret Byus '81 founded in January 2007 their Righteous Rides nonprofit to rent vehicles to furloughed missionaries. That year, Righteous Rides put five Chrysler mini-vans on the road. Byus oversees maintenance issues in their 70-vehicle fleet at their base camp at Moscow Mills, Missouri. Byus addresses power-train and electrical issues, as well as realizes efficiencies in parts, labor and troubleshooting, by communizing their fleet. Through God’s providence, the nonprofit purchased a 10-year-old auto dealership in a nearby town in Missouri—at a third of the original asking price. Their 10-acre facility has parking for 850 vehicles, sports a 20,000-square-foot building, and features an 8,000 square-foot showroom that’s currently being leased by a start-up church of 350. After graduating from LeTourneau in 1981, the two took separate career paths— Byus went to Chrysler; Reighard to Boeing. The two both returned to their hometown in 2005 with the intention of shifting gears. Reighard brought his business experience incorporating a 501c3 with tax exemption status. Byus used what he had learned from his “day job” to introduce a reliable vehicle he knew inside and out. Staying in contact with LETU friends was also a motivating force in their decision. Some of the challenges included where to find a car, how to buy a car (with no credit, insurance or experience), who to turn to if it breaks down and what to do with it upon returning to the mission field. Byus said some had seen a 12-month furlough in the states costing $5,000 to $6,000 for transportation. “Furlough ought to be about recharging, relaxing and resting; and often it’s about headaches and hassles and high costs, so whatever we can do to be an encouragement is an asset,” Reighard said. “Word-of-mouth is a big deal in the missionary community,” Reighard said. “You can see it when a missionary from Kenya used a van, and all of sudden e-mails are flooding in from Kenya. Once they get a taste of the ministry and what it does, it takes that worry away. “If a missionary couple uses the van once, they usually go ahead and reserve their spot for their next furlough three years later, as well,” Reighard said. Righteous Ride’s fleet is often booked several years ahead. Volunteers, strategically located near larger airport hubs, help in expanding the ministry by ferrying vehicles between airports and the base camp in Missouri. Byus said he also calls on his East Texas friends for quick fixes when he can’t get to a vehicle. The ministry funds itself primarily by serving as a used-car lot; albeit a reputable one with an all-points system check and complete disclosure. Righteous Rides is licensed to accept, refurbish and resell donated vehicles, such as cars, jet skis, campers and boats. “We accept a car with its problems, fix the problems and then retail it, sometimes doubling the price and improving its value,” Byus said. He said donors get to maximize their tax deductions, don’t have to worry about selling the vehicle and know the money from their donation is going to a missions-minded organization. Besides donating vehicles, other ways people can be involved in the ministry is through donating time— especially car junkies with a few vacation days on their hands. Righteous Rides also ministers to the needs of the missionaries because each van comes to the family with a full tank of gas, a DVD player and a GPS navigation system, along with personalized backpacks loaded with toys for the kids and care packages with toiletries and snacks for the adults. Righteous Rides also offers a 24-hour hotline that missionaries across the country can call with confidence.